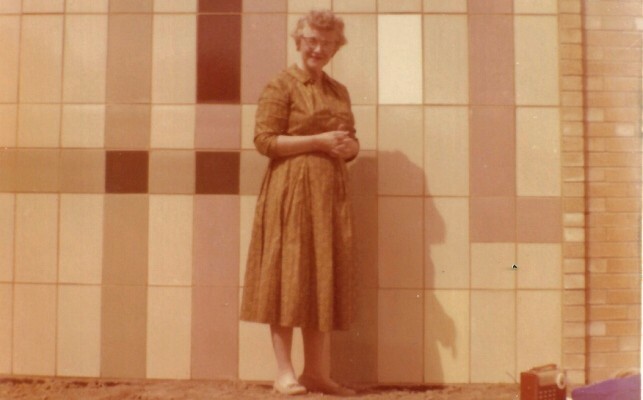 Helen Swisher Maurer, fifth grade teacher, stands in front of the decorative tile entrance on the north side of Palisade Elementary in April 1958, the first month the school opened. The school’s name was changed to Taylor Elementary in 1960 when long-time principal and educator, Avon E. Taylor, retired. The decorative tile walls have long since been concealed by additions to the building. Helen Swisher Maurer graduated from Palisade High School in 1923. She was not only a beloved educator, but also a talented musician. To commemorate the Town’s 50th anniversary in 1954, she was instrumental in creating the “Our Palisade Heritage” operetta. In the April 2, 1954 production, Mrs. Helen Maurer is credited for the “Musical Script.” She wrote new lyrics for popular tunes like “Glow Worm” to tell the uniquely Palisade story, “Grow Little Peach Tree.” Other teachers who were key to the operetta’s success included Mrs. Jewell Colwell for the scenery, Mrs. Ruby Gaither for the narrative, and Mrs. Nancy Morrison and Mrs. Louise Tolman for the dances. The operetta was performed by “Grades Five and Six” that year. The Town of Palisade and the Palisade Chamber of Commerce have asked Palisade High School to produce “Our Palisade Heritage” this December 4th as part of the CEN-TEN (Centennial plus Ten Years) celebration. If you are interested in helping with the production of “Our Palisade Heritage,” please contact Julianne Adams at the Palisade Chamber of Commerce 464-7458. Mrs. Maurer was my fifth-grade teacher. What a wonderful lady she was.